The Shaws are of my / my wifes family and I give the following pedigree of our lineage some taken from Ince peds with additional more recent information. Jethro Shaw of Oakerside Wensley was my 7XGrandfather (S G Flint) married Silence Godbehere widow of George Godbehere nee Annable of Cromford.. Annables were also my kin via other Grand fore bares. re Coates of Cromford / Killers of my line and Godbeheres my wife's direct kin..
6.Anne Shaw born 1750 married Isaac Hoades of Longway Bank Wirksworth they my 5XGrandparents on my mother's Wheatcroft, Annable, Webster, Heapey, Wigley, Hall, Shaw, Land, Sheldon, Cauldwell and Walker family.. Isaacs family were often Land / Mining Agents to Green- Goodwins of Wigwell Grange..
8.William Shaw married Anne Cooper adopted by Thomas and Anne Baggley on her father an Inn Landlord demise Thomas and Anne's daughter Fanny Baggeley married Frank Shaw..
An interesting photo of a brand new Private Owner wagon built by Hall Lewis & Co Ltd of Cardiff, for George Lovegrove & Co, suppliers of limestone & tarred limestone macadam for roadmaking. The wagon is number 215, a five plank Railway Clearing House 12 ton 5 plank 1923 standard design on a steel underframe. 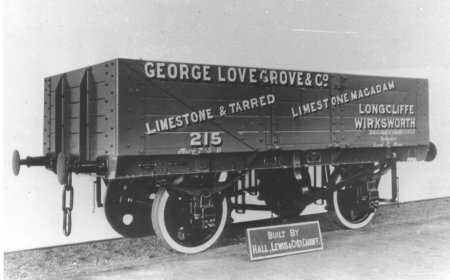 It carries the name of Longcliffe, which was the name of the company's quarry adjacent to the famous LNWR Cromford & High Peak Railway, and also Wirksworth, the station at the end of the former Midland Railway Wirksworth branch. Hoe Grange Quarry, belonging to George Lovegrove, (Longcliffe Limestone Co), lies 16 chains (0.3 kms) North-West of Longcliffe village (itself 1 mile North of Brassington). Here lay a short sidings North of the main Cromford and High Peak Line. It is thought the sidings were removed in 1942. Longcliffe village lies right on the North Western edge of the Wirksworth Area, and is part of Brassington Parish.